What you don't know CAN hurt you. Free expression is under attack around the world – and in our own backyard. Never before have we had so many ways to communicate, nor have we been faced with more ways to be silenced and censored. 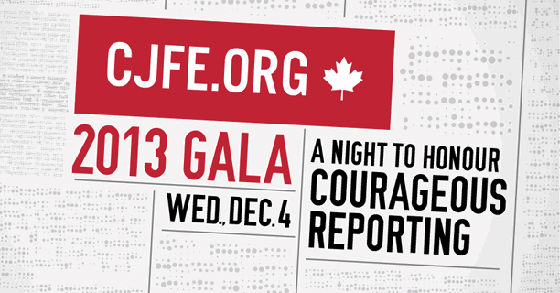 At the 16th annual CJFE Gala: A Night to Honour Courageous Reporting, we will celebrate the work of individuals who brought critically important stories to light despite facing severe persecution, personal threats and physical attacks. We invite you to join us December 4 at the Fairmont Royal York hotel in Toronto for this inspirational event. Please click here for tickets and event information. This year CJFE will honour journalists Dessale Berekhet Abraham, Mebrahtu Teclesion Berhe and Ruth Zecarias Ghebre from Eritrea, and Ahmet Şik from Turkey. These extraordinarily courageous reporters have covered stories about government corruption and social and gender inequality in the face of jail time, torture and other persecution. A freelance investigative journalist, Ahmet’s work focuses on corruption within the Turkish government. His reporting is highly critical of government officials, pointing to connections between illegal organizations and the military, and he has been both censored and jailed as a result of his work. A veteran print and radio journalist, Dessale was arrested, imprisoned and tortured by state officials in Eritrea’s most notorious prison, Wi'A. An investigative reporter with the major Eritrean magazine Hidri, Mebrahtu was imprisoned and tortured in response to his research on the detention of students in military camps and his coverage of women's issues. A broadcast and magazine journalist, Ruth became the target of persecution and threats of imprisonment after she produced stories on gender inequality and Eritrea's economic struggles. All three Eritreans were forced to flee to Uganda where they continued their work as journalists – creating Unitedvoices Media Center, a web-based press freedom initiative aimed at providing a hub for unbiased reporting on political and social issues in Eritrea. CJFE’s second-ever Integrity Award will honour Bob Thomson, a Canadian civil servant who, 40 years ago, blew the whistle on Canada’s refusal to accept Chilean refugees who had been violently attacked following General Augusto Pinochet’s military coup. As a result of Bob’s actions, Canada changed its policies and eventually welcomed 7,000 refugees from one of Latin America’s most brutal dictatorships. I ask you to please join us in supporting free expression and honouring these brave individuals either in person, or through our live blog and livestream. And, if you would like to support CJFE’s work, we invite you to become a monthly giver or make a one-time donation. We do not receive government funds for this vital work and instead rely on events like the Gala and the support of our many donors and volunteers. Every donation, no matter how small, makes a difference.